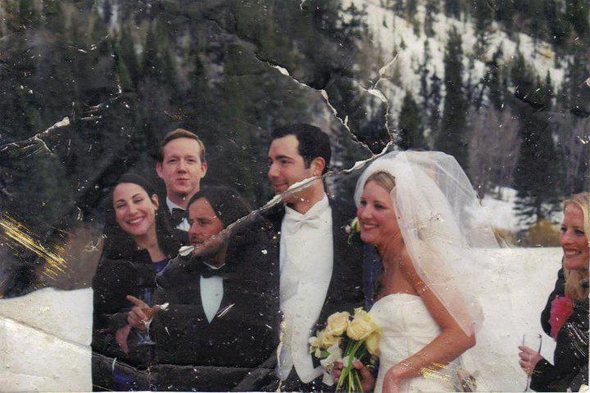 A woman who found a wedding photo in the rubble after 9/11 has finally located the couple in the picture 13 years after the terrorist attacks - and they are alive and well. Every year since 9/11, Elizabeth Stringer Keefe has circulated the photos with the hope of finding the wedding couple but received no response until she tweeted the picture again this year. On Friday, Ms Stringer Keefe wrote: "Attention wonderful world: ALL SIX PEOPLE ARE ALIVE AND WELL AND I HAVE JUST SPOKEN TO ONE OF THEM!!!!!!!!!!! #Happyending #911photo". Speaking to ABC News, she said: "I visited New York City, the World Trade Center site and my friend Jennie, who lived in New York City at the time of attacks. "She found the photo at Ground Zero in the days after the attacks, but was leaving New York City for a permanent move to California. "She gave it to me with the request that I do something meaningful with it." Stringer Keefe said: "I always hoped it was a neighbouring building or a coincidence and that everyone in it is alive and well." Boston Globe reports that Fred Mahe, from Colorado, saw her plea online and contacted her to tell her that he was in the photo and that it had been in his desk at the World Trade Center, but he was not in the office on 9/11. Speaking to Stringer Keefe, Mahe said that the wedding took place in Aspen and the bride and groom now live in California.